A versatile pianist and keyboardist, Wayne Hawkins performs throughout the country, collaborating with artists of varying styles of music. As both composer and arranger, Hawkins has written for a variety of films, commercials and recording artists. In addition, his discography includes over 40 recordings with a wide variety of artists. 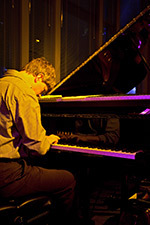 As a leader, his recordings include the critically acclaimed Wayne Hawkins Trio and his recently released “Solo” work. As a teacher, Hawkins was on faculty at the University of Kansas for eight years and recently taught at Skidmore College in Saratoga Springs, New York. In September 2014 he moved with his family to Ballston Lake, New York. He recently wrote Piano Aerobics for Hal Leonard Publishing, a book that teaches contemporary technique in popular styles. Hawkins is currently writing a second book for Hal Leonard publishing on keyboard harmony.